It also suits the frugal cook as you can use fish offcuts for it - or even those brick-like fish steaks - and those strange bags of frozen mixed seafood which are tremendously good value but which I can never think quite what else to do with. I first came across on the west coast of Sicily - it's a speciality of the town of Trapani. (I've just discovered that Ryanair fly there and that it's 33°C there today. Grrrr!) 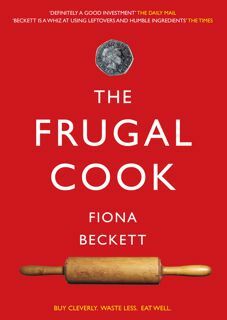 This is the version I put in The Frugal Cook. Apologies for the quality of the pic which was taken as an afterthought . . .
Heat a large frying pan over a moderate heat, add the oil and fry the onion for a few minutes until soft. Add the crushed garlic and spice mix, stir and cook for a minute then stir in the tomato paste. Tip in the tomatoes and half a small wine glass of water then simmer over a low heat for about 10 minutes until the sauce has thickened, mashing the tomatoes with a fork as they soften to break them down. Meanwhile make up the couscous following the instructions on the pack but using vegetable stock instead of water. Add the prawns, fish and mussels or seafood, if using, to the tomato sauce, mix lightly and heat through until cooked (about 5 minutes). Season and stir in the coriander and/or parsley, adding a little more water if needed (you want quite a wet, soupy consistency) Fluff up the couscous with a fork and serve with the fish. 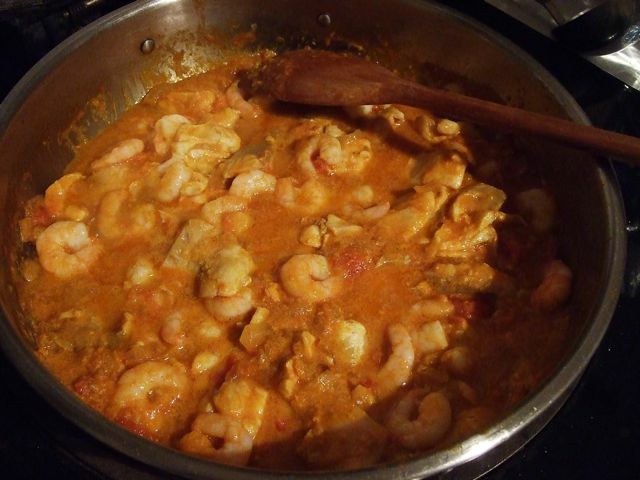 You could also obviously serve this fish stew with rice. Any other bright ideas for frozen - or chilled - seafood mix? Or other frozen fish for that matter. Do you use it? They're good - and underrated! yes they great in fish pie and risotto or pasta dishes! I'd love to sign up to your cheese blog (and your other blogs) but it's really hard; for some reason I can't do it from an Apple Mac - but it's the only computer I have. Is there any chance you could have an email sign up option? Hi Jo. I work on a Mac so I'm not sure it's to do with that. Both are hosted by Blogger so I would have thought you could sign up pretty easily if you had a Google account (though I admit I'm not the one to ask about tekky things). Anyone else have any suggestions? This recipe sounds fantastic, I am going to make sure I try it out. I would also like to take this opportunity to say how good your Beyond Baked Beans cook books are. I contributed to the website and you sent me a free book which I have made a lot of use out of and tremendously enjoyed.